We spend most of our time talking about Disneyland Park. It may or may not be our favorite (except that's a lie - it totally is!). So today we're focusing on California Adventure! Walt may not have built it, but it has plenty of Disney Magic! Keep reading to find out the amazing hidden gems at California Adventure that you won't want to miss. Usually we make these lists "countdown style," but I couldn't wait to write about my favorite thing! I always suggest going to Cars Land first thing in the morning to get Radiator Springs Racers fastpasses, but it's so worth coming back in the evening. Right at sunset (check with Cast Members for the exact time on the day you're there! 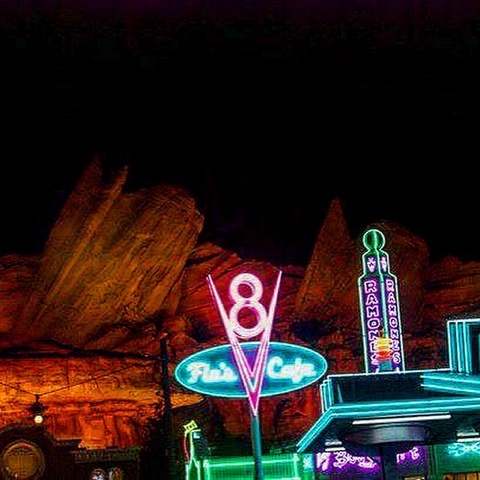 ), they turn on all of the neon lights in Radiator Springs and play "Life Could Be A Dream." You will feel exactly like you've stepped into the movie! It's beautiful and super fun to sing along. Check it out and enjoy! While waiting for the Pixar Play Parade (see the next section for more on this), we got to see a janitorial Cast Member drawing huge Disney characters on the ground with a wet mop. It was a pretty amazing sight to see! I haven't seen this done at Disneyland Park - let us know if you've seen it there! What a fun parade! All of the great Pixar characters are there on some really fun floats and there aren't crazy crowds three hours ahead like at Paint the Night (although, to be fair, it's NOT Paint the Night). I only waited about 15 minutes and had a great spot! These games are classic Boardwalk style with a Disney twist. The prizes are often Disney stuffed animals and you can end up getting them for much cheaper than in the stores! I've rarely seen more than one other person playing each game, so your odds of winning are great. Go have some fun and try them! Want to get wet on a hot day without the 60 minute (and up!) wait time? 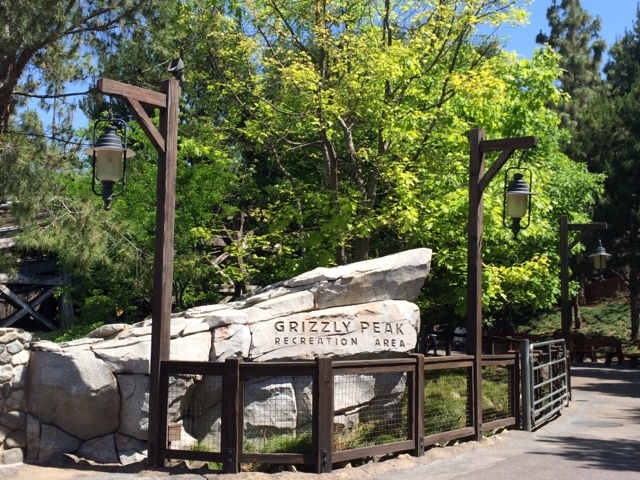 To the left of the Grizzly River Run entrance is a great viewing area for the ride's big drop! Stand back a bit if you just want to watch the screams. Once you're up close, you'll get soaked! It's the perfect way to quickly cool off in the summer heat! Are you a Disney Chase Visa cardholder? If so, head on over to the Meet and Greet spot way in the back of Hollywoodland every day from 10:30-1:30. I've seen Minnie, Daisy, and Stitch there and have always had great character interactions! BONUS! They'll give you a coupon for a free 5x7 of your picture! Just be prepared to show your card to be let in for the Meet and Greet - they always check! Ok, I haven't gone here myself, but I've been hearing about it a lot lately and I can't wait to try! 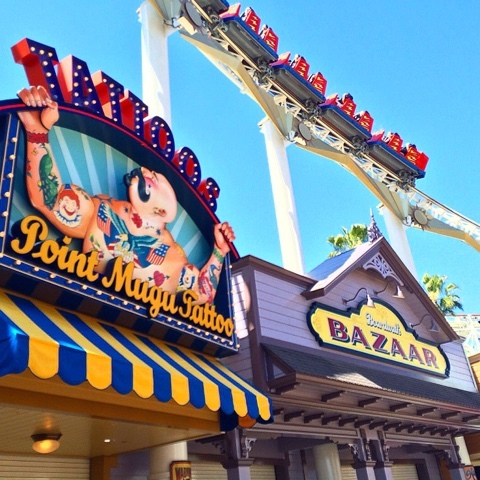 The Cove Bar is on the right side of the entrance to Paradise Pier, just after Ariel's Grotto. It's super easy to miss - I've always just passed right by it, thinking it's additional seating for Ariel's Grotto. But as I look at the menu online (tri tip sliders, anyone?) and see pictures come up on my Instagram feed of some pretty amazing cocktails, I know that this will become a favorite snack/drink spot in the very near future! Hello Melanie! I'm not sure how often it's done but I have seen janitorial cast members do water art several times in the walkway area of Rivers of America (in between The Golden Horseshoe and River Belle Terrace) after the last showing of Fantasmic!